QL+ funded a series of projects in conjunction with the USA Warriors Ice Hockey Program, which provides recreational and therapeutic benefits to injured Veterans through ice hockey. A study of current prostheses identified various technological limitations for sports use – especially in ice hockey, a high-impact, high-energy sport that requires fluid knee and ankle movement. Specifically, the goal of this Challenge was to develop a set of prostheses that would be more responsive to the skater when he skated. With regard to the socket, a materials analysis identified serious safety issues with the carbon fiber and molded plastic sockets currently used. These materials become sharp when fractured – more frequent in high-impact sports like ice hockey. This can damage the prosthetic vacuum connection sleeve, causing detachment, and cause injury to the user’s residual limb. The QL+ team of student engineers from Cal Poly assessed the lining materials in the suction socket connection and determined that sweat accumulation can affect limb-prosthesis connectivity. The vacuum suction socket was also studied; a user often “sinks down” into his prosthesis, due to perspiration and relaxation of residual limb muscles. This affects balance and causes lower back and leg pain. By analyzing the elements of current prosthetic leg designs, the QL+ team was able to design a prosthetic interface that addressed performance requirements including fit, “sink-down”, and sweat accumulation. By developing an improved prosthetic leg interface with enhanced safety, comfort and utility, this QL+ challenge will help lower limb amputees to enjoy ice hockey to their full potential. The solution can be adapted for use on other sports prostheses and in prosthetics manufacture as a whole. With regard to the leg prosthesis, the QL+ team built upon the success of a previous QL+ student team, who engineered a leg prosthesis that is safer, more stable and more closely mimics the fluid natural movements of the foot, ankle and lower leg for use during ice hockey. This latest iteration offered improved propulsion at take-off, enhanced maneuverability during use, and better stopping capabilities. It was also resistant to the high stresses and impact involved in ice hockey play, is waterproof, and easy to repair. This QL+ innovation provides unilateral, below-the-knee amputees with an innovative specialized leg prosthesis with enhanced power, stability, comfort and safety features. 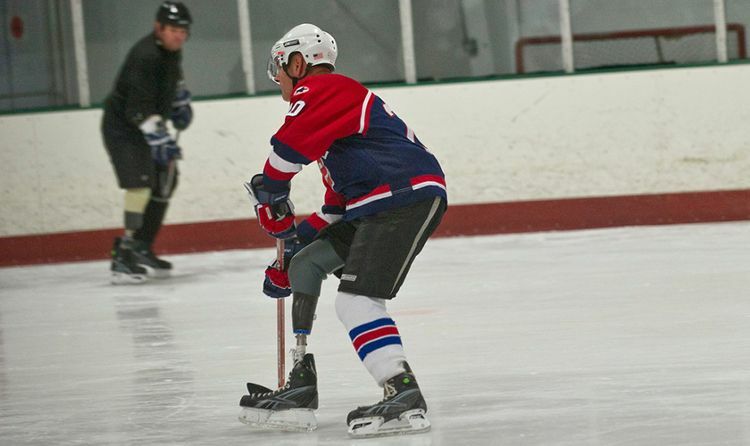 The prosthesis will empower wounded warriors to play ice hockey to their full potential. Elements of the research may be transferable to prostheses used in other sports and/or to prosthesis manufacture and production in a broader context.